Newton began his club career in England, playing with teams including Sutton United, Hampton & Richmond Borough, Wembley, Hitchin Town, Staines Town, Epsom & Ewell, Dagenham & Redbridge and Harrow Borough In August 2009, Newton had an unsuccessful trial with Football League side Gillingham. Newton made his international debut for Guyana on 22 February 2008 in a friendly game against Cuba.To date, Newton has appeared in eight international games for Guyana, including one World Cup Qualifying match in June 2008. 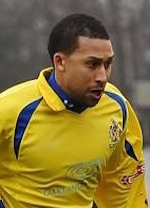 Signed for St Albans City and made his debut on January 28th 2012.